· CAL enables fine adjustment of temperature. 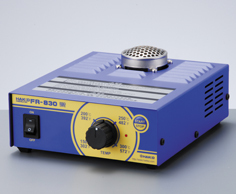 · The improved air outlet shorten preheat time compared with air conventional product. · Pushing the “START/STOP” button at the end of work automatically activates the cool-down function. Compact, lightweight, and slightly larger hot air outlet.